Nowadays, excellent customer service is considered the highest badge of merit that a company can earn. It is an attribute that many people value more than low pricing or even product quality. This is why entrepreneurs who focus on their clients’ needs and seek opportunities that take their customer service to the next level are gaining competitive advantage on the market. What’s more, social media users love to share their stories. User-generated content is a huge opportunity for companies to promote their services. The Internet is full of outstanding gestures that brands have made for individual clients. Even if you haven’t personally experienced customer service like this, you’d still pick companies going the extra mile for a customer. Read on and check out the best examples of good customer service situations. Brand24 is known for its individual approach to clients at totally unexpected moments. You can test us, go ahead! Just drop us a line in the on-site chat in the lower right corner. The story was widely shared in social media. A 26-year old loyal fan of Samsung messaged the company via Facebook, telling them that he enjoyed many Samsung products and asked for a free Galaxy S III to replace his old one. 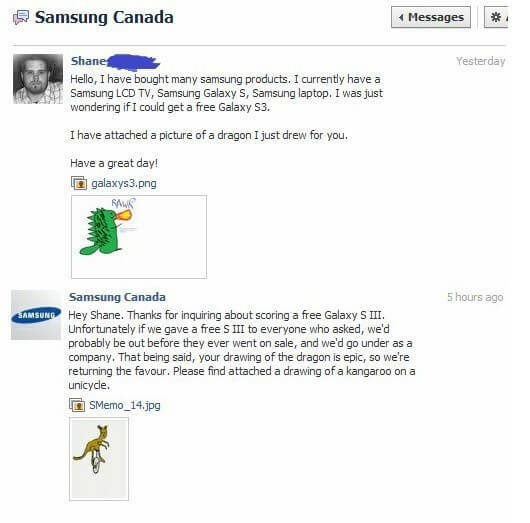 He even drew a picture of a dragon, just for Samsung. The company appreciated his effort and sent Shane a kangaroo drawing in return, dedicated to their loyal client. The delighted customer could not resist sharing the story on the Internet. As it went viral and gained much publicity, the company decided to gift him with the requested smartphone with the very same dragon he drew, etched right onto the body of the phone itself as well as the box it arrived in. Another story is about KROSS, a Polish company that makes bicycles and bike frames. They also make a great example of going the extra mile for a customer Three very young boys decided to earn and save money for their dream bikes on their own. They offered help around the neighborhood, like taking out the trash or shopping for groceries in exchange for small tips. Their positive attitudes moved the entire country and also the company, which decided to give them all new bikes. The Gaylord Opryland hotel knows exactly how to satisfy their regular customers. Christina McMenemy, who stayed at the resort three years in a row, was enchanted by the specific spa-music that the clock radio played at the resort. She desperately wanted to have one for herself, as every time she got back home from the Gaylord Opryland hotel, she found herself missing that light and relaxing music. 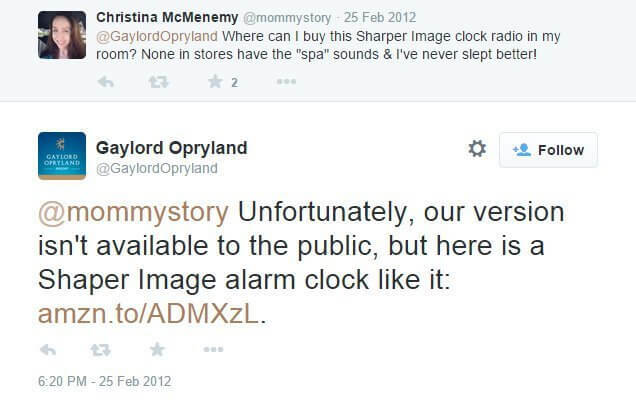 During her most recent trip to Opryland, she asked the hotel via Twitter where she could get the amazing alarm clock, but it turned out that it had been custom made for the resort. A little disappointed, Christina appreciated Opryland’s effort and gave up on the hunt for her dream clock. But to her surprise, when she got back to her room, she found two clock radios sitting next to each other along with a note, saying “we hope you enjoy these spa sounds at home”. Here’s another example of going an extra mile for a customer. You have probably heard of the Ritz-Carlton, a hotel chain known for their great customer service. On one particular visit, a mother together with her two children had spent a few days there on vacation, and when they got back home, her son discovered that his beloved stuffed giraffe, Joshie, had gone missing. The boy was devastated, so his parents decided to tell him that “Joshie is just taking an extra long vacation at the resort.” That very same night, the Ritz-Carlton called to tell them that they found Joshie. The relieved parents asked if the staff would mind taking a picture of the giraffe at the hotel to authenticate a fabricated story. After a couple days, the parents received a package with Joshie and a bunch of pictures that proved Joshie’s prolonged holiday. Another story starring a child and giraffe is related to the third largest chain of supermarkets in the United Kingdom, Sainsbury. The store sells bread that used to be called tiger bread. The company renamed it after a 3.5-year old girl’s “intervention”. Lily Robinson was quite confused by this product’s name as it did not resemble a tiger at all; it was more like a giraffe. The girl, with a little assistance from her mom and dad, wrote a letter to Sainsbury’s customer service department explaining her worries about the wrong branding. The customer support manager agreed with Lily entirely in his letter, admitting that calling the product tiger bread seemed a bit silly now. Lily’s mother posted the entire correspondence with the supermarket chain on her blog, unintentionally forcing Sainsbury to change the name of the bread to a more appropriate one. Lenovo Poland was given an unusual gift by one of its fans. He sent them a “homemade” Lenovo ThinkPad fitted with an old-school computer keyboard. You can admire his handiwork in the picture below (left). The company appreciated his effort and gift, reciprocating with a brand-new Lenovo ThinkPad. Now, that’s an example of going the extra mile for a customer! This story speaks for itself. A Pizza Hut customer who ordered on a regular basis had suddenly gone MIA. The Pizza Hut branch was concerned about its loyal client and called him, asking if he was okay, as he had not ordered from them for over two weeks. To his surprise, they also offered him a complimentary “welcome back” pizza. He did not hesitate to share the story on Facebook. LG also knows what going an extra mile in customer service means. A 10-year-old girl wrote an announcement about her lost LG E400 phone with a request for help in finding it. Internet users discovered this unusual handwritten publication and started sharing it in social media. It spread widely throughout the web and even reached the LG producer. The girl did not have to wait too long. The company soon surprised her with a brand-new LG Swift L3II. 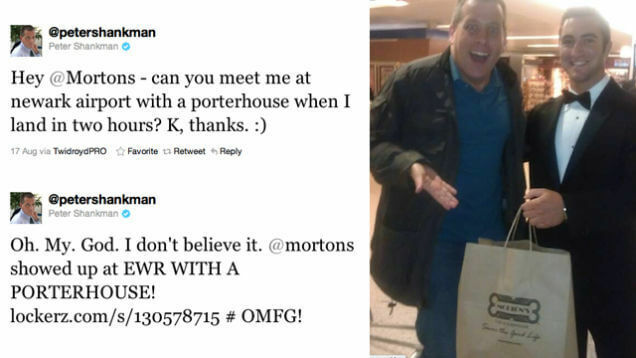 Peter Shankman, an angel investor, tweeted just before boarding his flight, asking Morton’s Steakhouse to meet him at the airport with a porterhouse steak on arrival. When he landed, he found a man wearing a tuxedo and holding a bag with a juicy steak inside. He shared this on his Twitter profile immediately. How to Provide Outstanding Customer Service? I believe we all agree on this one. It all starts with the attitude. If, however, you already have the right attitude, you might consider using social media monitoring to provide customer service to customers seeking assistance all over the Web. This way, you can track all online pieces of content mentioning these keywords. Among them, you can identify these customers looking for help. Once you find customers in the need of assistance, you can reach out and help them out. Using Groups, you can group mentions thematically, for example, depending on a problem. With social media monitoring, you save time as you can see all mentions in one place. There’s no need to go to each social media platform your company is present on and manually look for such mentions. Here you can learn more about social media monitoring. Or, if you feel like, social media monitoring is something you need, try it out. It’s absolutely free (no credit card required). Do you know other great examples of outstanding customer service? Or, if you have one, give me an example of when you went the extra mile for a customer!